This issue's cover is from Emma Chichester Clark's picture book, More! Emma Chichester Clark is interviewed by Quentin Blake. Thanks to Andersen Children's Books for their help in producing this cover. Two more titles in Macmillan's crowd pleasing collections of paperback poetry from performance poets who do the rounds of schools and libraries and know what junior school children want. Like many others in the series, Aliens ... is edited by Moses, while Don't Look at Me ... is all his own work, some of which has appeared in other collections. The emphasis, complemented by Maddison's bold cartoons, is on fun and the kind of poem that makes an instant impact read aloud. Kids, teachers and librarians will find plenty to make poetry and story sessions go with a swing. Children will like the look and feel of the books. 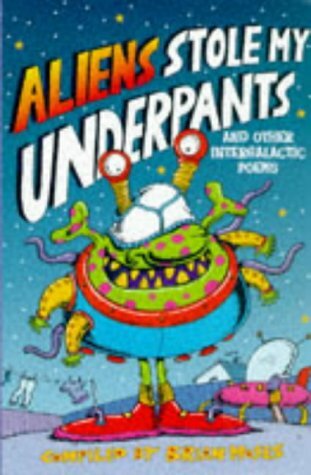 However, the quality of the poems is uneven and it is rare in Aliens ... to find a poem that exploits the subject's potential for mystery and fear, or contemplates the strangeness of life in the universe (and on earth) without playing it for laughs. Moses's own poems are more varied. He has some rollicking word games and good jokes and there are poems that are more thoughtful even when he pursues crazy notions to extremes, as in his poem about a school's ban on kissing. Perhaps there are too many poems about teachers; and I think it is in some of his quieter moments, like 'The World Record Tree Climbing Contest' and 'The Bonfire at Barton Point', that he seems to get inside a child's experience and you have a real sense of a view slightly askew of the adult version.